The latest patented model in our shotcreting machine series. The extrusion roller of the shotcreting machine features a state-of-the-art design, which saves electricity and ensures smooth grout feeding. The shotcreting machine uses direct drive to start the speed reducer, strengthening its working efficiency, decreasing its electricity consumption, and making the machine easier to operate. Operated by a computer control system, the machine enables more applications than previous models. Extruding capability is a maximum of 100m (vertical) and 300m (horizontal). For grout feeding in large amounts, the shotcreting machine is easy-to-operate, featuring low rotating speed, high twisting force, and a high torque speed pulley. 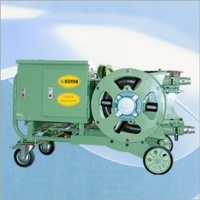 Using an extrusion roller, the shotcreting machine ensures smooth shotcreting and grout-feeding.